Nigerian refugees arrive in Sayam Forage camp, an hour-drive away from Diffa, the main city in the region. Security and humanitarian conditions are deteriorating in southeast Niger, where hundreds of thousands of people settled after fleeing Boko Haram insurgents, the United Nations refugee agency warned today. According to government figures in mid-May, the area in and around Diffa was hosting over 241,000 people, including refugees from Nigeria, displaced people within Niger, and returning Niger nationals who had been living in Nigeria. Some 157,000 people who have fled Boko Haram terror have settled in 135 makeshift encampments along 200 kilometres of Route National 1, a major road that runs parallel to the border with Nigeria and the Komadougou river. Living conditions along Route National 1 are harsh. “In this remote and semi-desert environment, temperatures are reaching 48 degrees Celsius in the current dry season, while rains that will follow in two or three months often flood the ramshackle settlements,” said spokesperson Adrian Edwards of the Office of the UN High Commissioner for Refugees (UNHCR). He said that shelters are made of straw, and sanitation is basic, with few latrines and showers. Many children do not have access to education because of limited schooling structures in the nearby villages, which are already overcrowded, and because of closures of many schools in insecure areas close to the border. Food supplies are irregular, and the local population is not always able to share their meagre resources with the displaced people. The security situation around the towns of Diffa and Bosso, to the east, has deteriorated in recent months, with a succession of criminal incidents including suicide attacks near villages and spontaneous sites where both Nigerian refugees and the internally displaced are being sheltered. Two large markets along that road have been closed since April out of fear that infiltrated insurgents could attack. This hits livelihoods and the local economy. A 7pm to 5am curfew is in force across the region, which has been under a state of emergency since February 2015. Many of these people have been displaced two or three times prior to settling along the road. Both the local and displaced communities are fearful of new attacks, Mr. Edwards said. Aid agencies are struggling to bring assistance to the displaced due to the highly insecure environment, the increasing number of sites – some of them remote – and a lack of funding. Of $112 million required by 22 aid agencies, including UNHCR, for operations in the Diffa region in 2016, only $20 million has been received to date. Ten days ago, at the government's request, UNHCR started to relocate hundreds of refugees from two spontaneous sites along Route National 1 to a camp some 50 kilometres from the border. Although most people prefer to live outside of the camps, they have decided to move for both protection reasons and for access to food and adequate services. The camp presently hosts some 3,000 people. 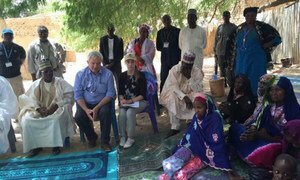 Wrapping up a two-day mission to Niger, the top United Nations humanitarian official has called for greater attention to the crisis unfolding in the country's Diffa region, where violence at the hands of Boko Haram has forced more than 240,000 people out of their homes on both sides of the border with Nigeria.